Star Trek is in the centre of each Millenial geek’s heart. A Bluetooth communicator designed as the Star Trek Communicator has been made to celebrate the 50th anniversary of the first-ever Star Trek TV episode. The communicator itself is made of various metals and ABS plastic replicating the original. The great thing about this is it’s also functional. It works as a Bluetooth communicator which connects to your smartphone. Through the communicator, you may answer calls, make voice commands, and play music (albeit not very loudly). Using it should be very novel since it also makes the same noise when you flip it open. Ending a call gives a “communication terminated” alert which should do great for cosplayers. The package also comes with a magnetic wireless charging base, complete with a logo and a U.S.S Enterprise imprint. 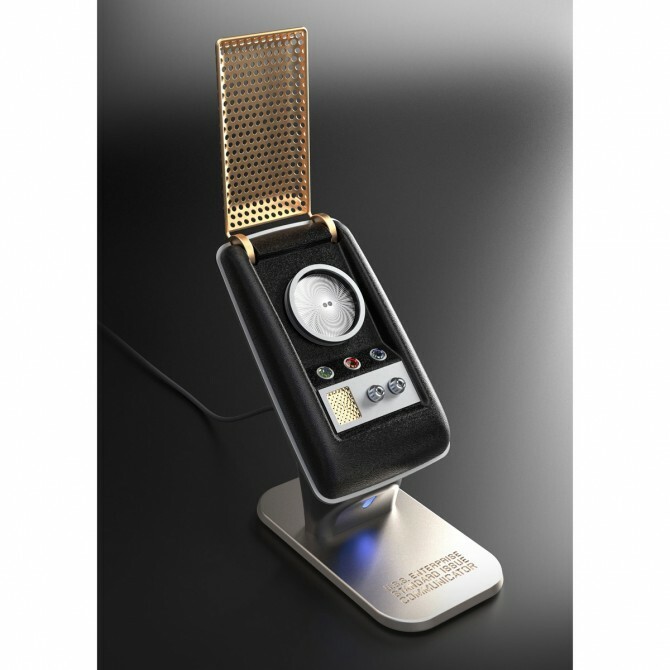 You simply place the Star Trek Communicator on the base, and it will charge while staying right in place. Although we aren’t expecting much from a replica device coming from a TV show, it’s great to see that it can actually do something functional. If you’re planning on buying this, head over to the Star Trek shop and ready $149.95.